I've been doing more stitching with the Aurifil 12 weight thread and am really excited with the results. I've long been an admirer of Red Work, but uncooperative fingers don't allow me to do much hand embroidering. Doing it free motion is incredibly quick and easy, and very satisfying. Red Work is so feminine, you can't help but love the delicate look. I decided to stitch out a Christmas wreath I had designed a few years ago. For the first run through, I only did the centre section, thinking it will make a sweet cushion. 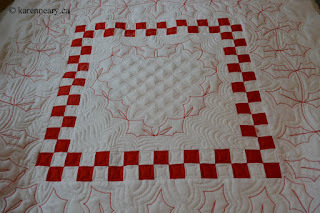 A little red piping on the edge will frame it nicely. 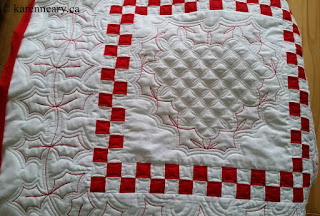 Since it turned out so well, I added some patchwork chequerboard, pieced with a solid red and white from Michael Miller's Cotton Couture line. 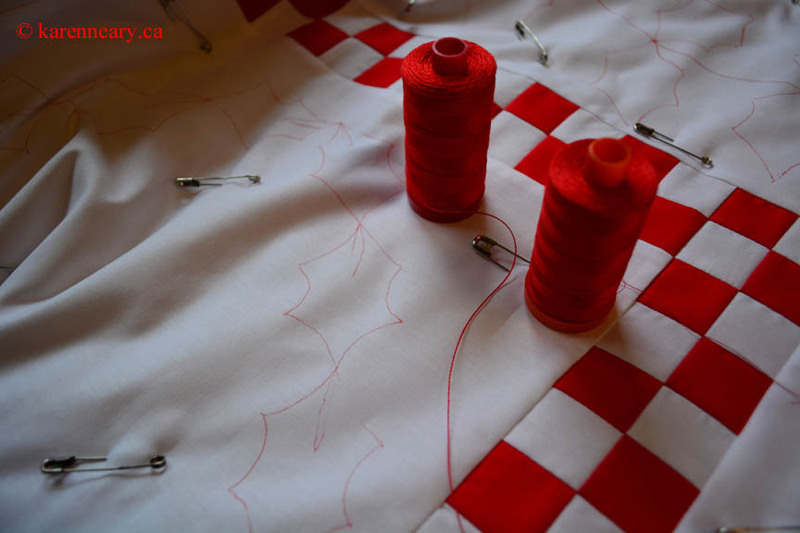 The needle thread for the Red Work is Aurifil 12 weight and in the bobbin is Aurifil 50 weight, both in my favourite 2250 bright red. 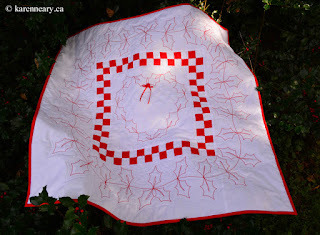 I traced the design with a red FriXXion pen (and hope that won't come back to haunt me...) Then I layered the top with wool batting, and a polka dot backing. 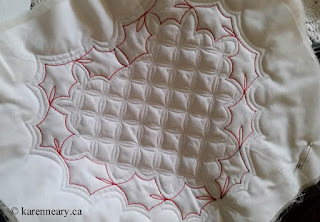 I timed the stitching of the centre heart: 3-1/2 minutes, which included a stop to take a couple of pictures. When I finished the lines in red, I switched to a 50 weight white cotton thread and quilted the piece as usual. A plain narrow red binding frames the edge. 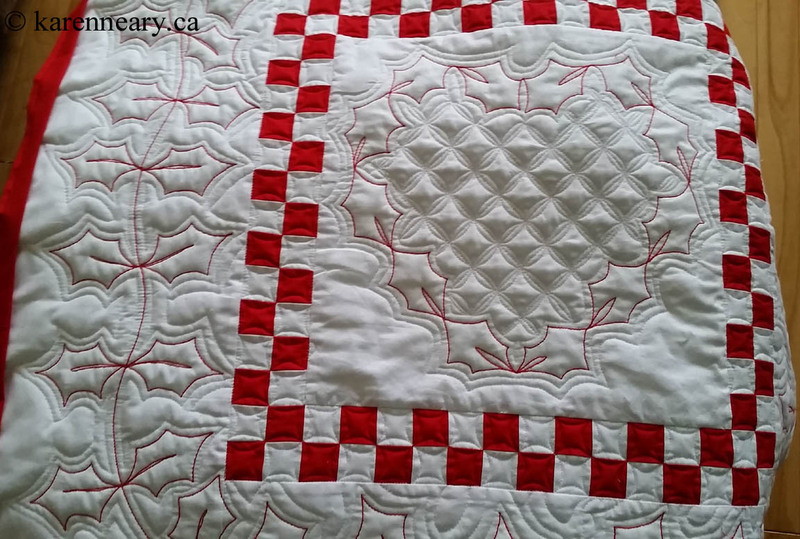 I've stitched it three times now, each version quilted a little differently. 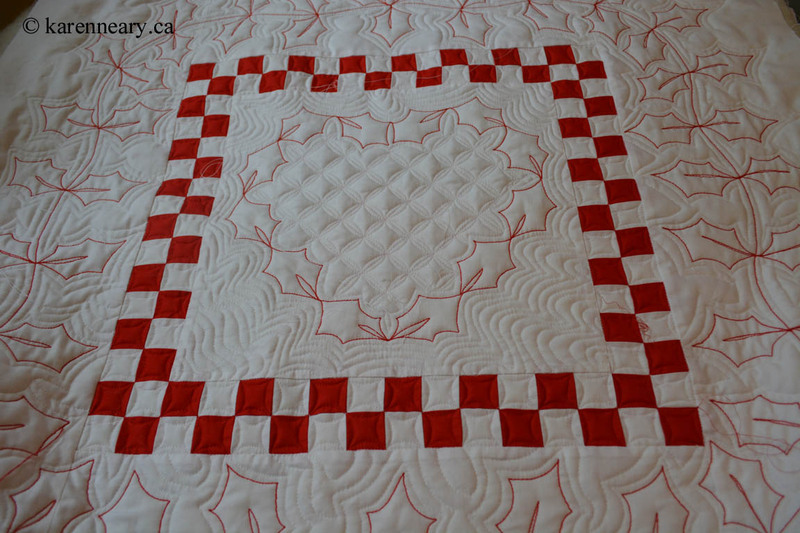 As easy as it was to stitch, it was certainly not easy to photograph. By our holly hedge seemed a logical spot, but the yard was shaded and the stitching doesn't show well. 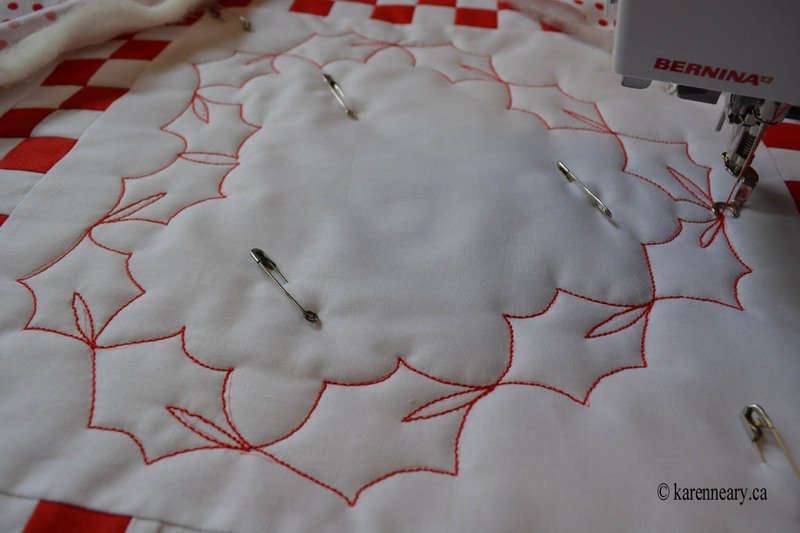 This one on the table is a little clearer, and you can see how nicely the stitching looks. You would never know it wasn't hand embroidered. Thank you to Cheryl Coville for her help in proof-reading the instructions. You can download the pattern for Red Work Holly here or order a printed copy from my website. I'd love for you to try this method and let me know what you think! 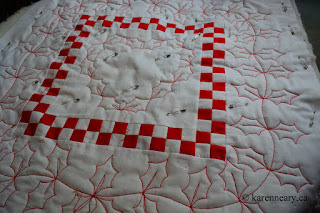 I love red work and have done a few but they are so much work, I never thought of machine stitching them. 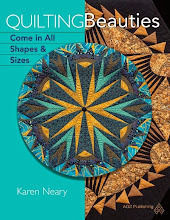 Love your pattern and thanks for sharing. 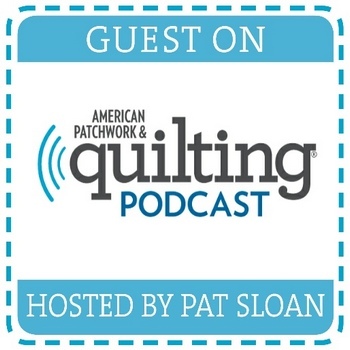 I have read these posts with great interest, Karen, I have never even thought to use the Aurifil #12 in the machine and am eager to have a play like you have done - thanks for the inspiration!